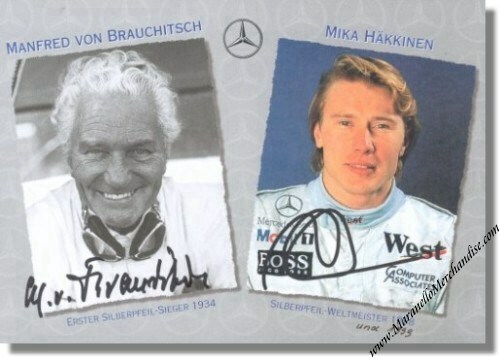 Mika Hakkinen (1968 - ) and Manfred von Brauchitsch (1905 - 2003) signed Mercedes Benz fan card. The card celebrates Manfred von Brauchitsch who was Mercedes' first "Silver Arrow" Grand Prix winner in 1934 and Mika Hakkinen, Formula One World Champion in 1998 and 1999. This card has been signed by both Hakkinen and von Brauchitsch! A Certificate of Authenticity will be provided with this item that guarantees you that the signatures are genuine or we give you your money back.